Jonah Lynch received a grant of land. He called his property Blessing after the ship that brought him to the new colonies (Irving, p. 135).
?  The Blessing was divided up into three plantations: Blessing, Cedar Hill, and Cherry Hill.
?  Henry Laurens purchased the Blessing and then proceeded to purchase Cherry Hill and Cedar Hill (Irving, p. 136). While in the possession of the Laurens family the plantations were once again divided. 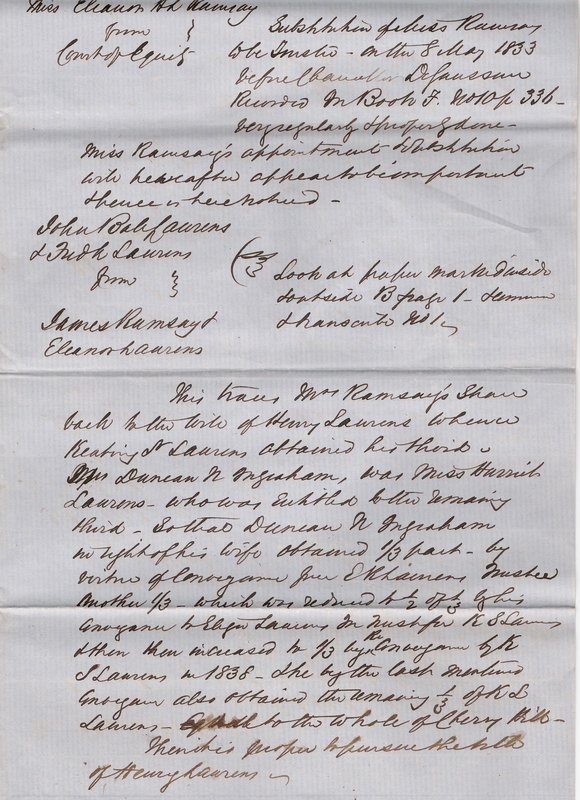 A 1838 Title Abstract traces division and the ownership of Cherry Hill through several of Henry Laurens' children. 1843  Commodore Duncan Nathaniel Ingraham married Harriet Horry Laurens, a granddaughter of Henry Laurens. It is believed that Commodore Ingraham inherited Cherry Hill through his wife (Irving, p. 137). 1927  The Wellington Corporation purchased all three plantations. A year later they sold them to T. Ferdinand Wilcox, Esq. and Edward Roesler, Esq. (Irving, p. 136). John B. Irving, A Day on Cooper River (Columbia, SC: R.L. Bryan Company, 1969).